Here in the Midwest we get a short season to grill, therefore we do it a lot in the summer. With all that grilling comes leftovers. Honestly, my family isn’t all that excited to eat the leftovers and I am not all excited to waste food. So that leaves me some creativity to turn yesterdays leftovers into something my family will enjoy. Let’s get started! and removed the meat from the bone and chopped it into a bite sized dice. Sweet Baby Rays BBQ sauce- and some non stick spray. (I have used butter it works great I was just trying to save a few calories). Provolone was best). Sprinkle with some chopped onion. sauce. Definitely just add all ingredients to your taste. 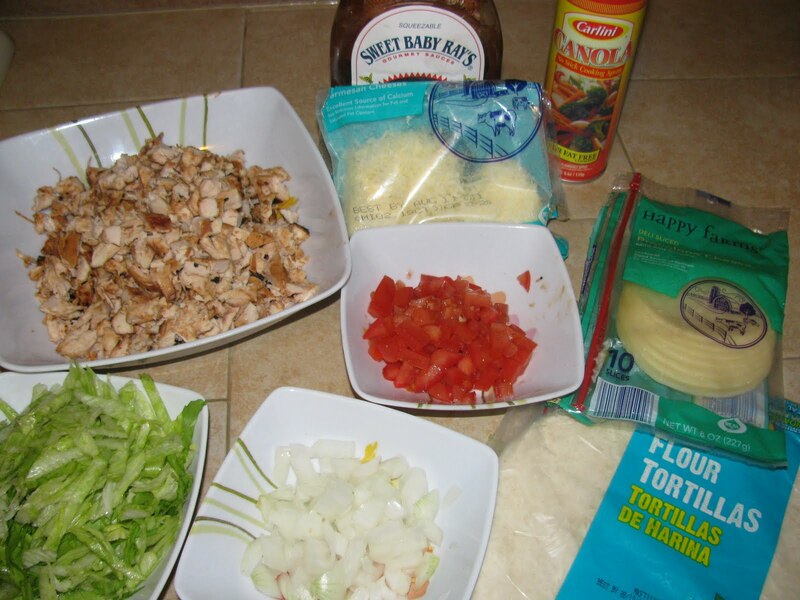 4-5 minutes per side or until tortilla is crispy and cheese is melted. 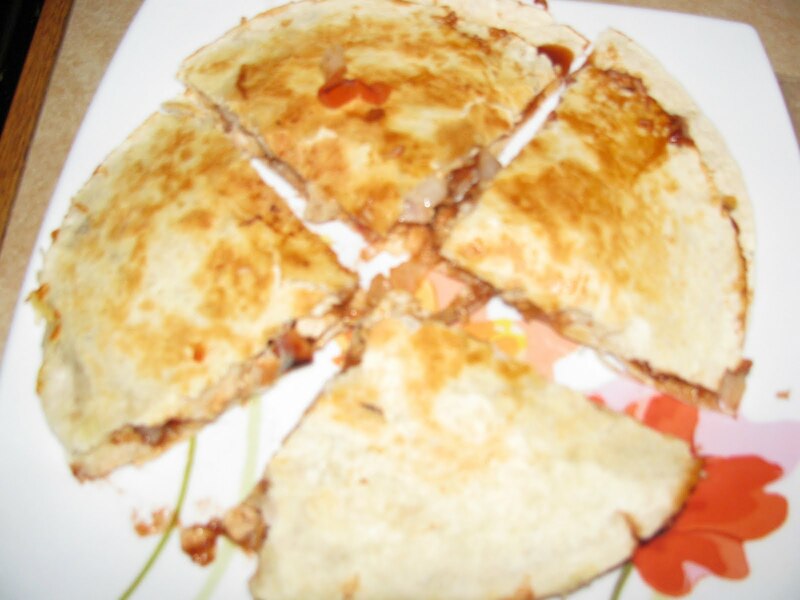 quesadillas and 2 half quesadillas. Heat skillet over Medium heat and spray with non stick spray. 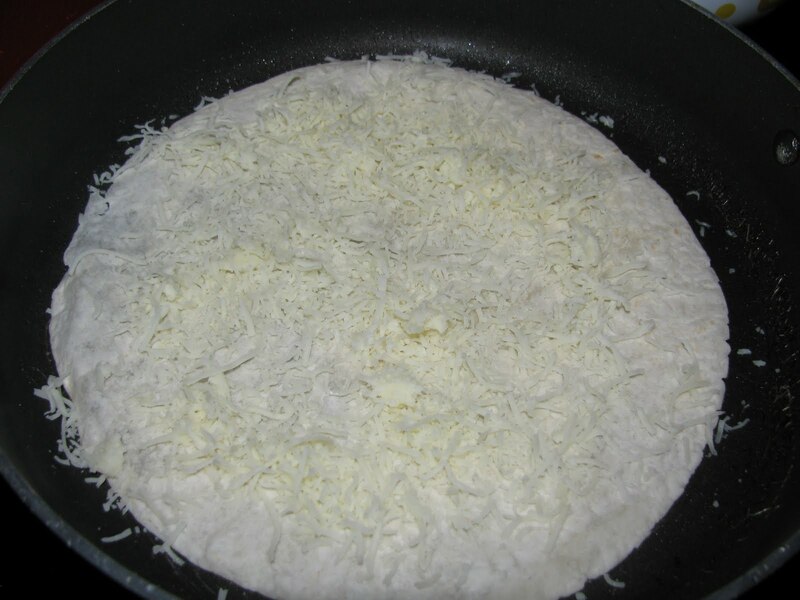 Lay tortilla in pan and add cheese. 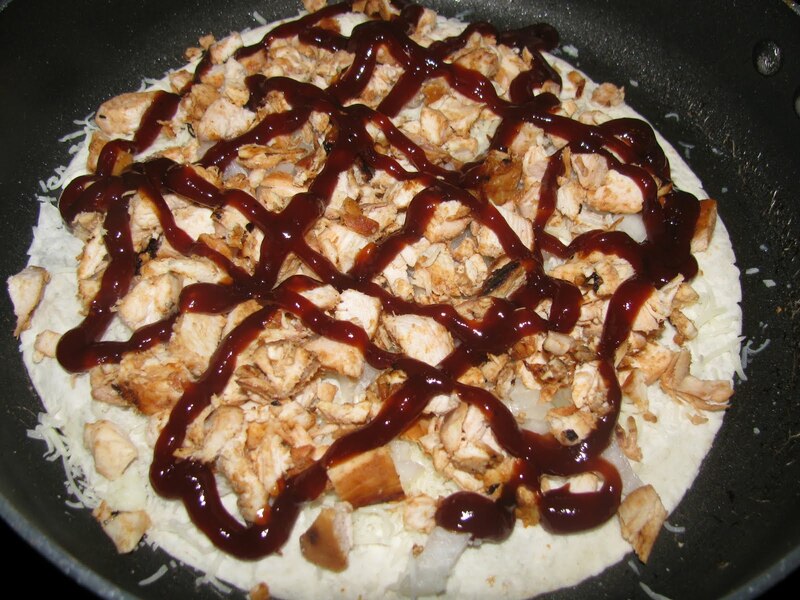 Evenly top tortilla with chicken and add BBQ sauce. 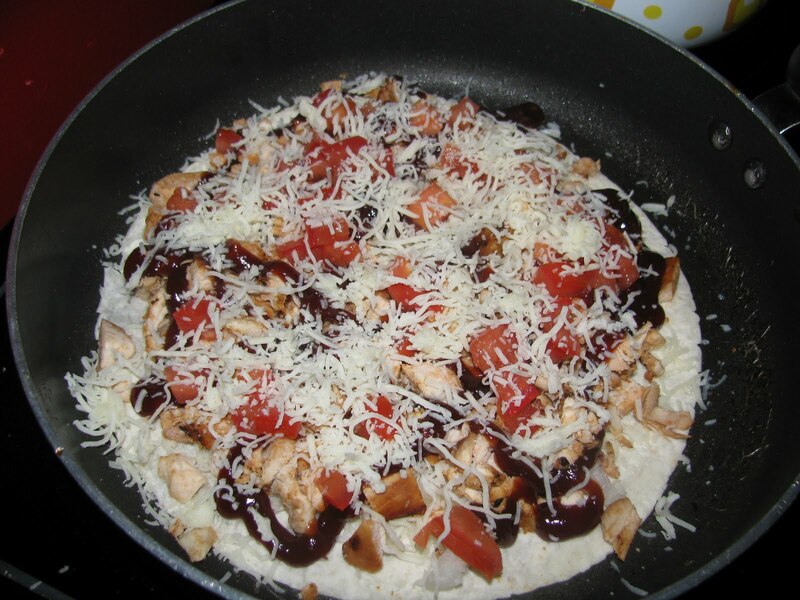 Sprinkle with tomatoes and top with more cheese. Lay another tortilla on top of the ingredients and cook 4-5 minutes per side or until tortilla is crispy and cheese is melted. Cut with pizza cutter and serve with your favorite toppings. This was a big hit with my family! Definitely going on the please make again list! Just like with most of my recipes you can personalize it to your tastes. This would be delicious with some grilled green peppers and mushrooms! If you are cooking more then 2 quesadillas I would put a foiled lined baking pan in a warm oven to keep the finished quesadillas warm until you are ready to serve. Also, you can cook 2-3 quesadillas at a time on a large griddle. I hope you enjoy this delicious easy recipe! Thanks for stopping by! There is something about the words strawberry and cheesecake that just makes my day. So imagine my delight on a recent Pinterest pin-fest that I came across this little gem. So in my usual fashion I decided to make my sweet and sometimes brave family guinea pigs once again. If you are interested in this recipe keep on reading. This and love is all you need. 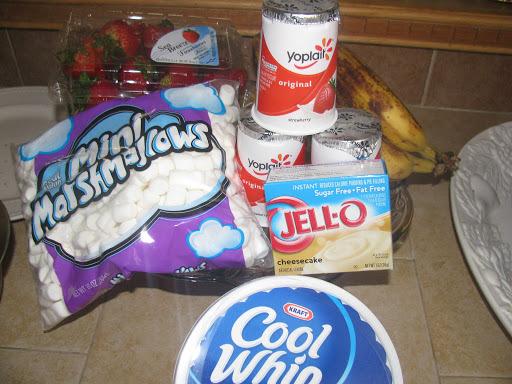 Add the yogurt, cool whip, and pudding mix into a bowl and mix well. 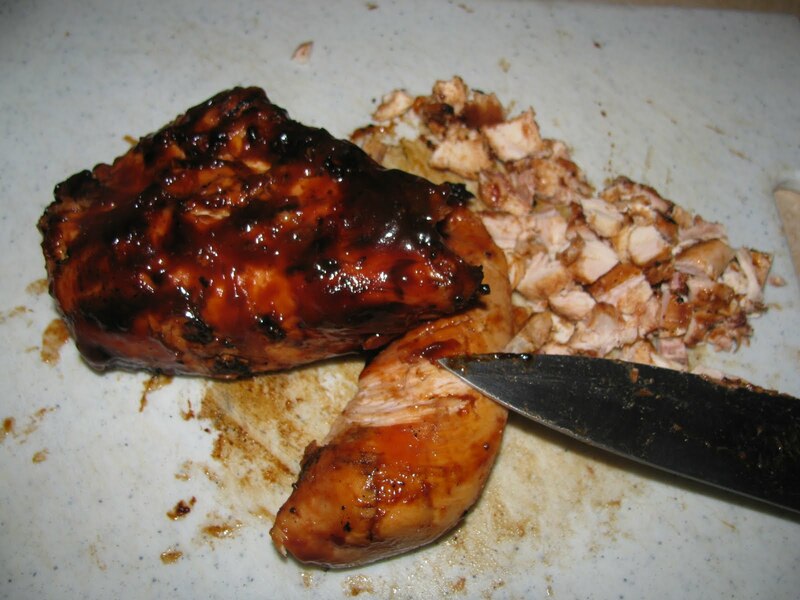 Place in the refrigerator for 1 hour. If you made it the whole hour-pat yourself on the back. 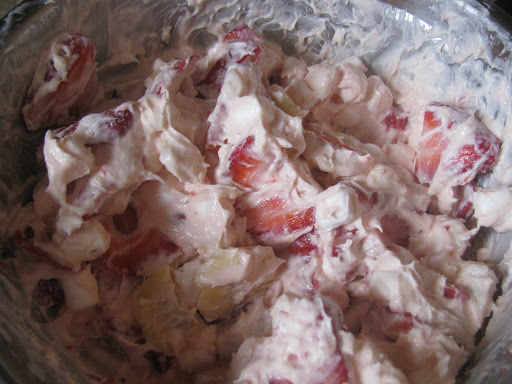 Add all sliced strawberries, bananas, and marshmallows. Mix well. Just for the sake of “science” I dished two little scoops on the plate. Portion 1-NO crushed graham crackers. 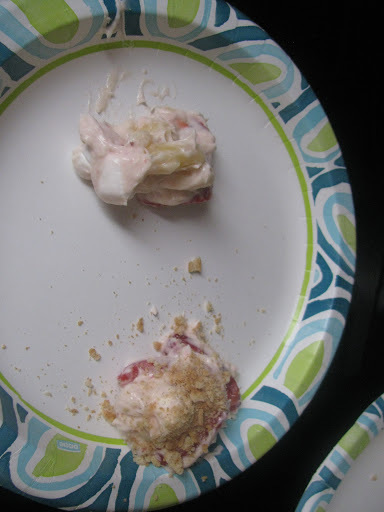 Portion 2-With crushed graham crackers. 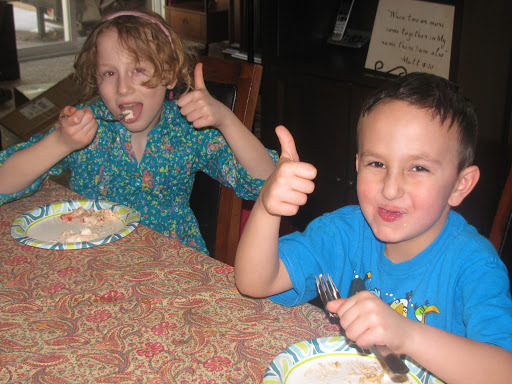 So what’s the verdict?……..
Two enthusiastic on camera thumbs up and three off camera thumbs up. No graham crackers was the winner. We really enjoyed it and it couldn’t of been easier! It is best when served fresh . If you would like a little crunch-go ahead and get wild and add some crushed graham crackers on top. Thaw whipped topping if frozen. 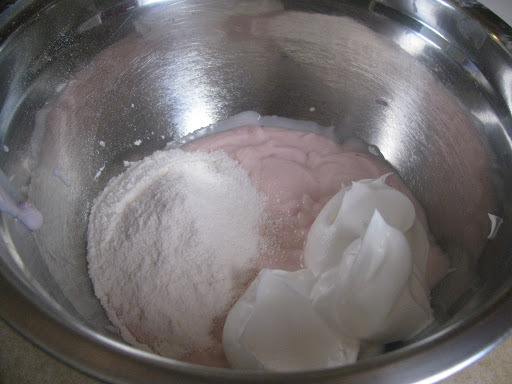 In a large bowl stir together whipped topping, yogurts, and pudding powder. Place in the refrigerator for at least an hour. Wash and slice strawberries. Before serving add strawberries, bananas, and marshmallows. Add crushed graham crackers on top if desired. Follow me on Pinterest. You know you wanna!